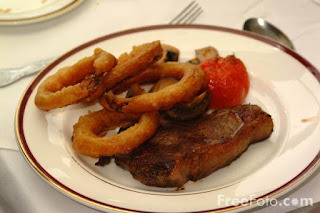 Photo Credit: Traditional Sunday Lunch: Steak and Onion Rings, by Ian Britton. June 22nd is... National Chocolate Eclair Day, Global Smurfs Day, Baby Boomer's Recognition Day, National Onion Rings Day, Stupid Guy Thing Day! Read: The Smurfs Anthology, by Peyo -- When the Belgian cartoonist Peyo created a village of cute little woodland creatures for his heroes Johan and Peewit to discover, he couldn't have known that they would wildly outgrow those humble origins to become a worldwide phenomenon all on their own. More than 50 years later, The Smurfs continue to delight us all with their silliness, bravery, heroism, and heart, and now we finally have a definitive collection of Peyo's original comics to see where it all began.